DJ Lord Jazz from the legendary group Lords Of The Underground (L.O.T.U.G) is back with a vengeance, releasing his very first solo album “The Plain Dealer”. 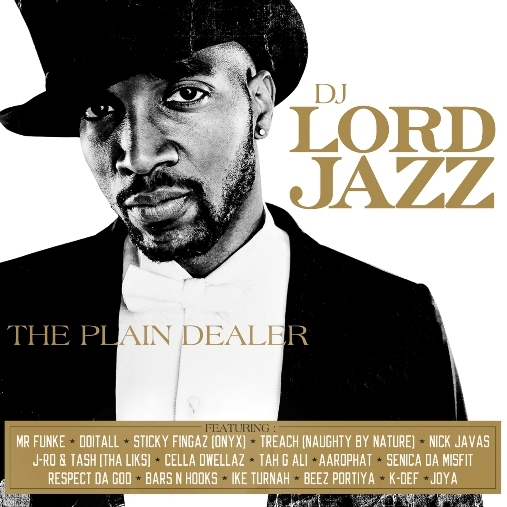 “The Plain Dealer” compromises of Hip Hop the way the Lordjazz intended, 12 tracks strong, the album features guest appearances from renowned artists including; Mr Funke and Doitall from Lords Of The Underground, J-Ro and Tash from Tha Alkaholiks, Sticky Fingaz from Onyx, The Cella Dwellas and Treach from Naughty By Nature. DJ Lord Jazz describes his highly anticipated album as hard hitting drums, nice loops with dope verses and scratches. Now residing in Paris, the Lord produced the entire album abroad which is dedicated and inspired by DJ Lord Jazz’s good friend, Darnel Chase who was murdered in Newark New Jersey in 2008. The two established a record company called "Premium Records" along with Jazz's brother Eric Colston. “Since then, I’ve been working on this project because it’s not just for me I’m doing this for Chase and his family,” says Lord Jazz.His first release “Say yea” is a crowd pleaser, having already gaining air play by the legendary DJ Premier’s radio show"Live from HeadQcourterz"on Hip Hop Nation/Sirius Satellite. "This song is vintage Mr Funke,if you like his old high pitched style and flow your going to love this track"says Jazz.The track also has a remix by one of the most under rated Hip Hop producers,K-Def. “These are some of my favorite MCs’ and I was fortunate enough to get them on my album. I also have new mc's that need to be heard around the world like Aarophat, Senics Da Misfit, and Ike Turnah ” says Jazz. Keeping the L.O.T.U.G spirit alive, Lord Jazz ensures he has carried his experiences and influences from the group onto the album.“One thing that we always tried to do on our albums which Busta Rhymes said to us back in ‘93 to C.L.A.M.P ya sh**, that means C is for concept, L is Lyrics, A is for Attitude, M is for Music, and P is for Performance. To this day we abide by that because it makes so much sense,” he says.